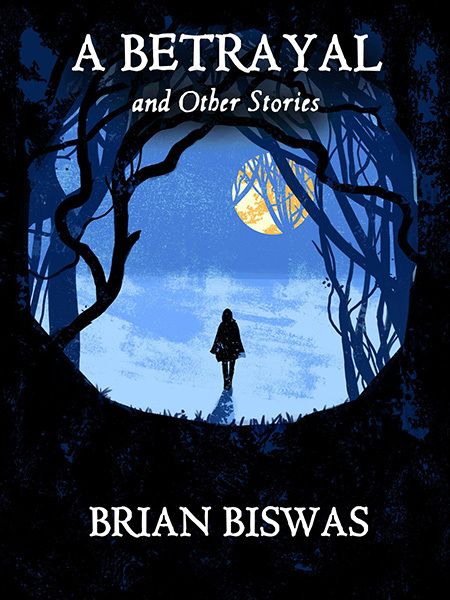 Next up in our Year of Reading at the Irreal Cafe is Brian Biswas’ first collection of short fiction, A Betrayal and Other Stories. This volume, published by Rogue Star Press (an imprint of Lillicat Publishers), contains nineteen stories which span nearly thirty years of Biswas’ writing career. Beginning with the cover and its evocative illustration of a lone figure walking through what seems to be a moonlit and shadowy forest — and the title, which features my favorite story in the collection, “A Betrayal” — I found this collection of Biswas’ work to be first rate. In his author’s bio, Biswas states that his stories are either written in a literary style reminiscent of magical realism or are straightforward science fiction, fantasy, and horror. But having read through the collection, and with no desire to contradict the author’s view of his own writing, I would put the stories in one of three categories: irreal stories (because of course I am Coeditor of The Cafe Irreal), gothic or neo-gothic tales, and straightforward horror and/or science fiction stories. I enjoy Biswas’ writing in all three of these dimensions and found the stories to be satisfyingly literary, as well as entertaining. The small black-and-white illustrations that accompany each story complement Biswas’ fiction very nicely. But back to the irreal: Brian Biswas has written eight stories that we’ve published in The Cafe Irreal and which we consider to be irreal, including three of the stories found in this volume. The qualities we are looking for in an irreal story involve reality being undermined, the dream state being evoked, and the story having a certain Kafkan sensibility. In particular, we found all of these qualities in Biswas’ story, “A Betrayal,” which reminded us greatly of Kafka’s “A Country Doctor.” In fact, we liked the story so much that we included it in our 2013 anthology, The Irreal Reader. Though “A Betrayal” is notably different from Kafka’s story (the doctor deals with a girl in love rather than a wounded boy; he faces different obstacles and ends up in a different situation), the setting and narrative call Kafka’s work to mind, and the doctor’s sense of betrayal at the story’s end echoes Kafka’s doctor’s mindset at the end of “A Country Doctor.” But there are other aspects of the story that are also very representative of Biswas’ style, such as the clear descriptions of the characters’ physical appearance, something that can be found in nearly every story in this volume. The woman who calls the doctor at the beginning of “A Betrayal” is described as the narrator imagines her, “her left hand frantically brushing back her ash-blond hair,” and she in turn describes her ailing daughter as “feverish and pale… her eyes swollen, and red.” And yet despite the realistic nature of these descriptions we enter an irreal realm in which the doctor tells us about the patient’s village of Tamborini, which is one of those small communities that “are here one minute and gone the next,” which suddenly opens before him as he travels along, and which, as he leaves it and takes a few wrong turns, may have brought him hundreds of miles from home. Rounding out the appearance of the irreal in this volume of stories are two other stories that we published in The Cafe Irreal, “The Bridge” and “In the Garden”, as well as “Sedgefield’s Diary,” in which the diary begins to write the man instead of the other way around. Biswas masterfully writes a certain type of story that some might call gothic or neo-gothic tales. Some of these stories are set in the past and others in a somewhat anachronistic present. These latter tales remind me of the best episodes of The Twilight Zone or Science Fiction Theater and yet they still have a certain gothic sensibility. In “The Roses of Charon,” for example, a short fat man comes to the door offering something that will make its recipient “rich beyond your wildest dreams” and Meredith, a woman in a cotton house dress, is at home in her kitchen when a door-to-door salesman calls, as women often were in the 1950s and 1960s. Meredith is a woman in distress until she learns the surprising nature of her visitor. Another such story is “Barnegat Inn,” in which a couple on their honeymoon end up in an out-of-the-way inn with its odd collection of furniture and timepieces “ranging from modern to antique,” including a “Japanese mulberry pillar clock.” The somewhat odd older couple who run the inn have a secret that is revealed in time and in a way that, combined with the setting, makes for a very successful story. And then there are the more straightforward science fiction stories, such as “A Journey Through the Wormhole,” in which a scientist has found a way to create small wormholes that make interstellar travel possible in response to a challenge by a wealthy investor. The description of temperature variations and their effect on wormhole creation is compelling, and the presence of a science journalist who is interviewing the scientist in question gives the writer a way to give this information to the reader without creating an “info dump.” Also in this category is”Puff” in which the human quest for unlimited sources of energy leads to what seems to be the perfect solution: nuclear fusion, a form of power generation which doesn’t have the negative side effect of waste that has to be disposed of. The story ties the successful creation of fusion power with the search for intelligent life elsewhere in the universe, and Biswas again gives information both about how fusion power might be harnessed as well as how we might conduct a search for extraterrestrial life. This story is both a cautionary tale and a very good example of hard science fiction. Whether the stories in this anthology remind me of the work of Kafka or Rod Serling or have their own unique style, I find Brian Biswas to be a writer of great descriptive skill and storytelling ability. His prose is lucid and straightforward, and it leaves vivid images in this reader’s mind that come back from time to time, long after I’ve finished reading, to remind me of these satisfyingly strange and well-written stories. You can buy A Betrayal and Other Stories at Lillicat Publishers or from Smashwords, Amazon, and Barnes and Noble. Or you could order it at your local bookstore.